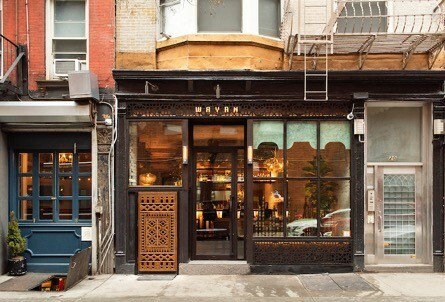 Architecture and design studio Rockwell Group has just unveiled Wayan, a new French Indonesian restaurant located in the Nolita area of Manhattan, New York. Inspired by Indonesia’s cuisine, with an added modern French flair, the new restaurant on the fashionable Spring Street in Lower Manhattan is led by French-American chef Cedric Vongerichten, Chef de Cuisine at Perry Street and son of renowned chef Jean-Georges Vongerichten, and his Indonesian wife Ochi Vongerichten. Wayan translates to firstborn in Balinese and offers approachable dishes that highlight the vibrant flavours of Ochi’s birthplace of Jakarta. 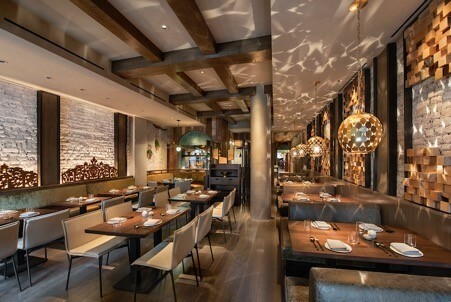 Rockwell Group has given the restaurant’s existing white brick walls a milky wash and added wooden floors, rustic teak paneling, amber glass, accents of oxidized copper, batik screens and authentic carved wood pieces from Indonesia. 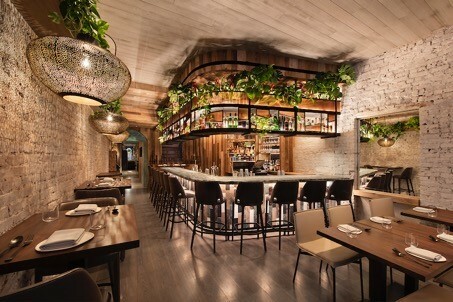 The result gives the space a distinctly tropical feel whilst also holding on to a sense of New York’s Downtown aesthetic. 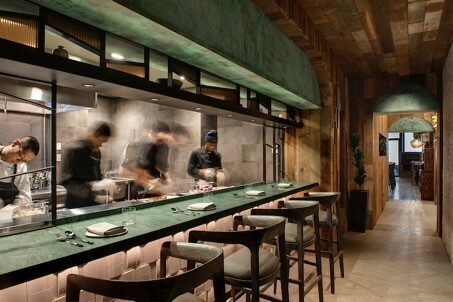 The restaurant’s entry façade features oxidised copper glazing, laser-cut batik screen detailing, and an authentic Indonesian wood service door. Once inside, the front room is a light and airy space with white-washed brick walls and a white-washed wood ceiling. For Wayan, Rockwell Group designed a range of custom light fixtures composed of clustered, hand-painted glass globes that cast beautiful shadows at night and add warmth during the day, as well as custom banquettes positioned at the window that add visual interest from the street. The bar frontage in the main room features a mix of marble slats in multiple tones, with amber glass millwork above and an antique mirror. The transitional space between the front and back dining rooms of Wayan features live-edge wood drink rails and shelves, celebrating the natural edge of the wood, rustic teak wall paneling with carved details and a raffia-patterned porcelain tile floor. Guests can have a view into the open kitchen from a white tiled bar with a turquoise stone top and oxidised copper millwork. 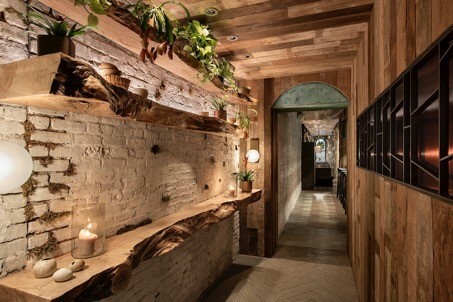 The moodier rear dining room has a wood ceiling and floor and here the whitewash brick walls have been accented with authentic carved wood pieces from Indonesia. Custom double-sided, daybed-style banquettes with low backs encourage a more casual, social atmosphere.